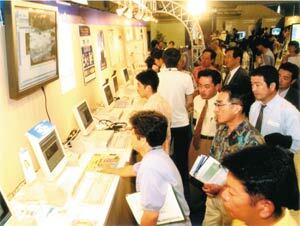 The 15th annual Multimedia Fair Okinawa opens this Friday and Saturday at Okinawa Convention Center in Ginowan City. The main theme of this year's event is mobile Internet connections and applications. The two-day event will feature a wide range of seminars and multimedia related events as well as exhibitions by local computer and IT companies. 55 companies will show their products and services inside the convention center with informational booths in order to attract and educate people about a potentially lucrative industry. The Japanese central government and Okinawa Prefecture have a long established plan to develop the prefecture into a high-tech center and hub for information and communications in the Asia-Pacific area. The hope is that the development would alleviate the long stagnant local economy and help reduce the highest unemployment rate in the nation. Ryukyu Shimpo newspaper and NTT West Japan Co. Okinawa Office sponsor the event. The exhibition is open from 10 a.m. to 6 p.m. on both days. Admission to the event is free.